Original engine. Exhibit at London Science Museum. Replica engine. Exhibit at the Glasgow Museum of Transport. Engine. Exhibit at the Glasgow Museum of Transport. 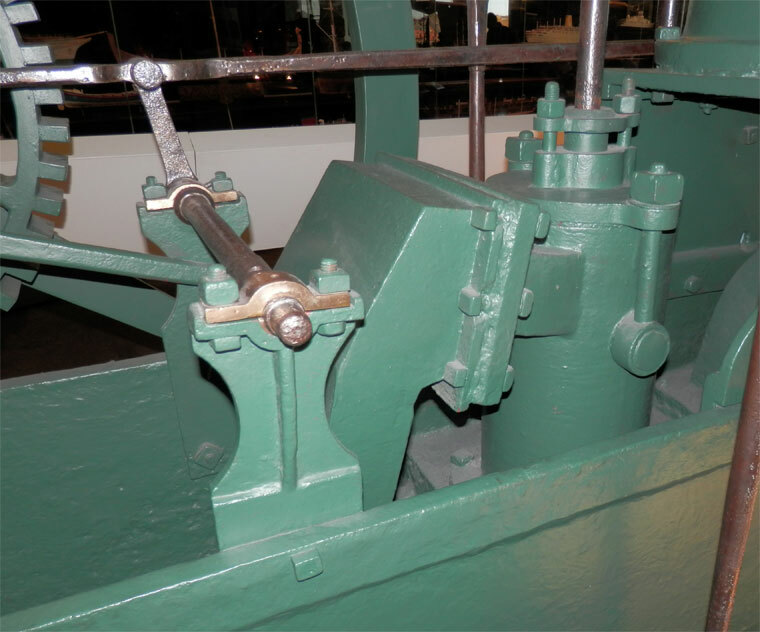 Original cylinder, which proved too small and was replaced by one slightly larger in diameter. Exhibit at the Glasgow Museum of Transport. The paddle steamer PS Comet was built for Henry Bell, hotel and baths owner in Helensburgh, and began a passenger service in 1812 on the River Clyde between Glasgow and Greenock, the first commercially successful steamboat service in Europe. Henry Bell had become interested in steam propelled boats, corresponded with Robert Fulton and learnt from the Charlotte Dundas. 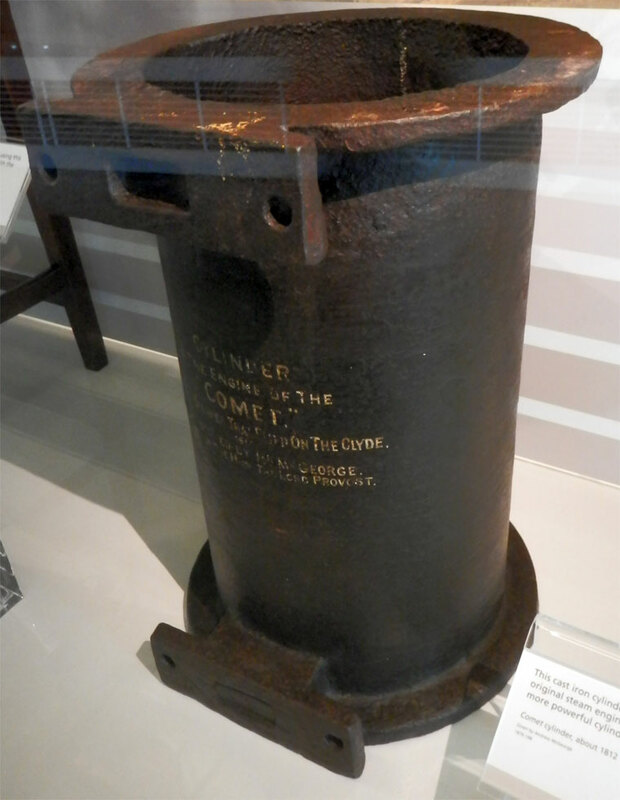 In 1811 he got John Wood and Co, shipbuilders, Port Glasgow, to build a paddle steamer which was named the Comet after the "Great Comet" of 1811. The 28 ton craft was 45 feet long and 10 feet broad. 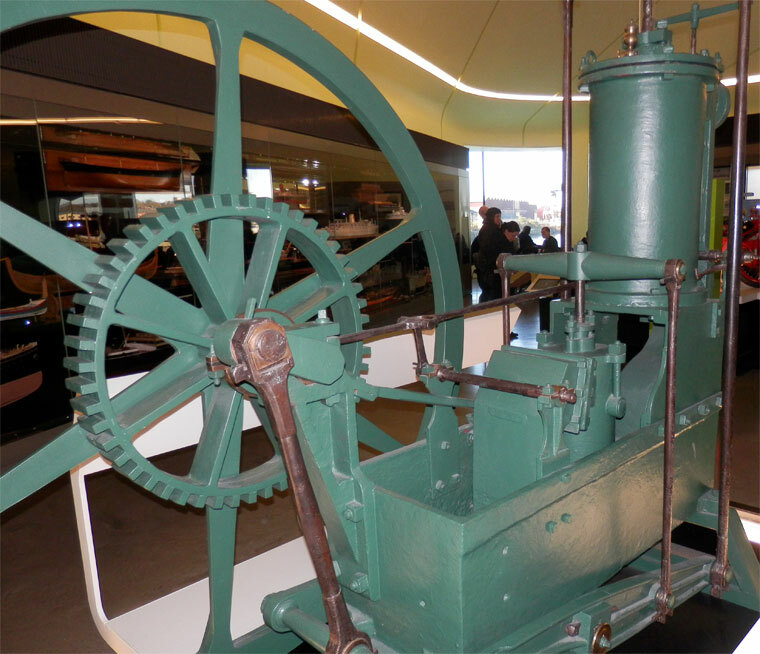 It had two paddle wheels on each side, driven by engines rated at three horse power (or perhaps 4 hp. 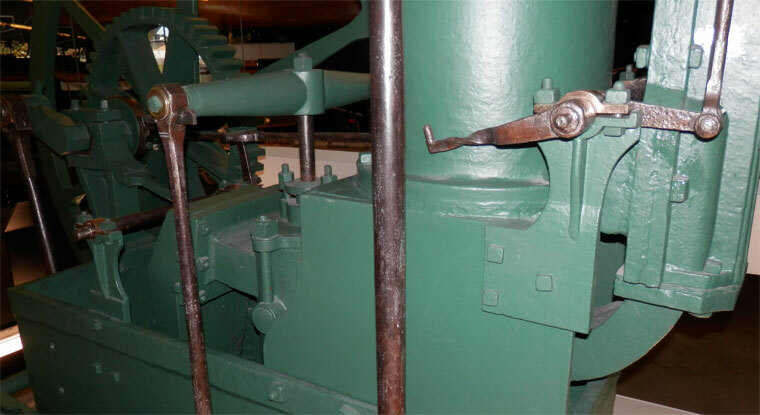 ): at a later date the twin paddle-wheels were replaced by a single paddle-wheel on each side. 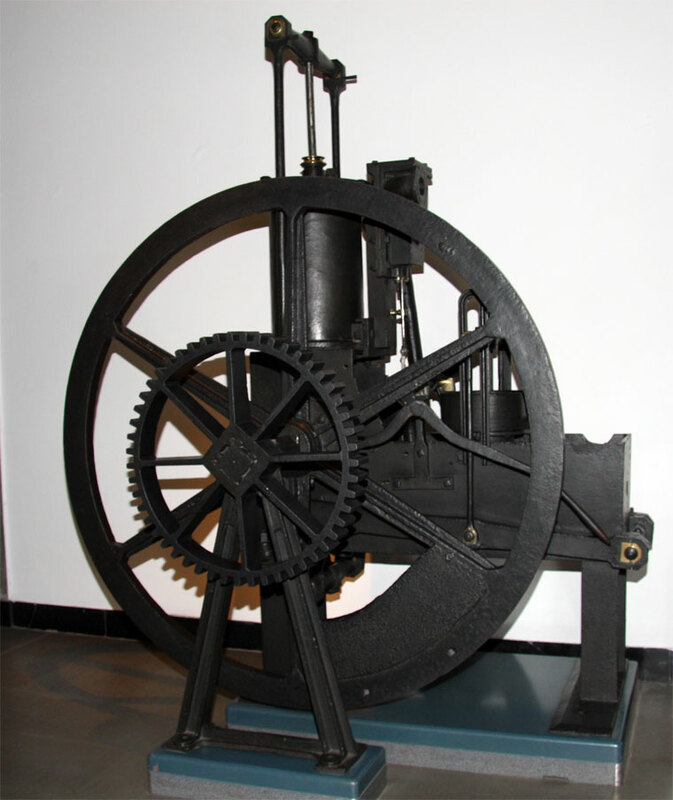 The first engine were made by John Robertson of Glasgow, and the boiler by David Napier, Camlachlie, Glasgow: a story has it that they were evolved from an experimental little steam engine which Bell installed to pump sea water into the Helensburgh Baths. The funnel was tall and thin, and a yardarm allowed it to support a sail when there was a following wind. A tiny cabin aft had wooden seats and a table. "The subscriber, having at much expense, fitted up a handsome vessel to ply upon the River Clyde from Glasgow, to sail by the power of air, wind, and steam, intends that the vessel shall leave the Broomielaw on Tuesdays, Thursdays, and Saturdays about mid-day, or such hour thereafter as may answer from the state of the tide, and to leave Greenock on Mondays, Wednesdays, and Fridays in the morning to suit the tide. The fare was "four shillings for the best cabin, and three shillings for the second." 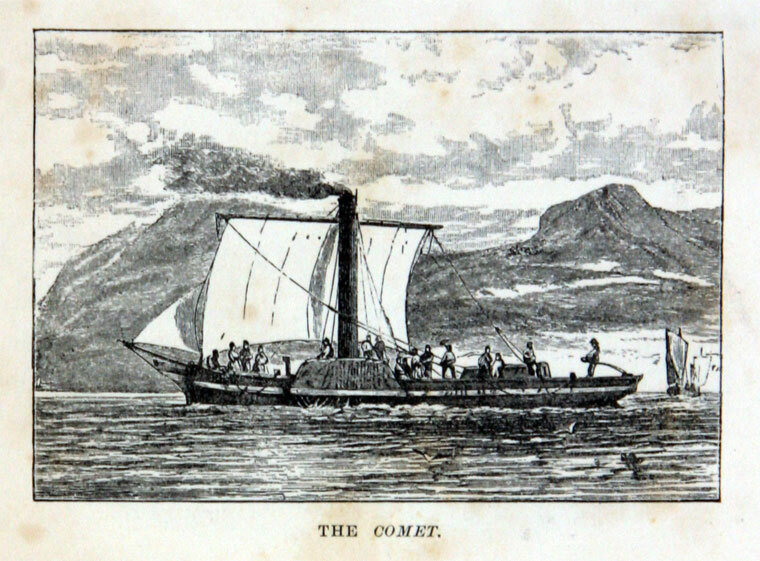 In 1812 the Comet made a delivery voyage from Port Glasgow (a town just to the east of Greenock) 21 miles upriver to the Broomielaw, Glasgow, then sailed from Glasgow the 24 miles down to Greenock, making five miles an hour against a head-wind (some sources give a date of January 18, 1812 for a trial trip, McCrorie gives August 6, 1812 for the delivery, with the historic trip a day or so later). The success of this service quickly inspired competition, with services down the Firth of Clyde and the sea lochs to Largs, Rothesay, Campbeltown and Inveraray within four years - the Comet was outclassed by newer steamers. Bell briefly tried a service on the Firth of Forth. 1819 Bell had the Comet lengthened and re-engined by Thomas Hardy and from September 1819 ran a service to Oban and Fort William (via the Crinan Canal) a trip which took four days. 1820 December 13. 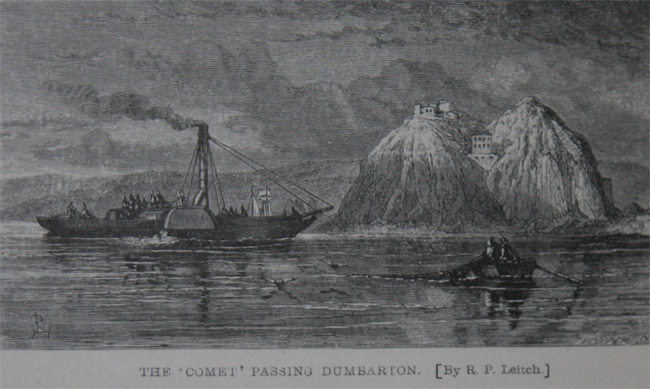 The Comet was shipwrecked in strong currents at Craignish Point near Oban. 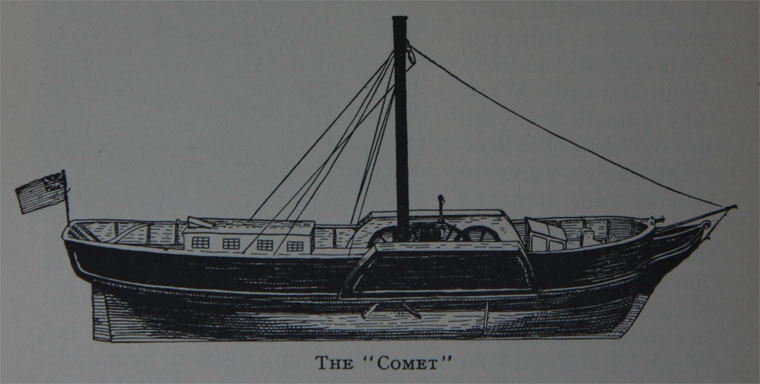 A successor vessel, Comet II, was built but Henry Bell seems to have been its manager, rather than having a financial interest in the vessel. On 21 October 1825 she collided with the steamer Ayr off Kempock Point, Gourock, Scotland. Comet II sank very quickly, killing 62 of the 80 passengers on board. A replica of the Comet made by shipyard apprentices now stands prominently in Port Glasgow. This page was last edited on 7 April 2017, at 15:33.